Heather Ford and I have a new commentary coming out in Environment and Planning D: Society and Space. 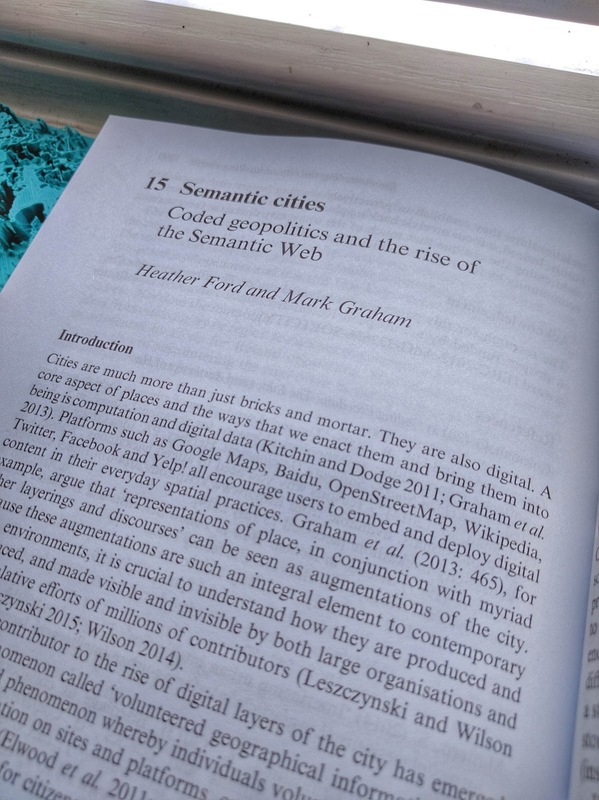 As places are ever-more augmented by digital content, and the internet becomes ever-more structured by linked data and the semantic web, we ask what this means for the ways in which people interact with everyday places. Specifically, we highlight our concern that non-specialists will have ever-less control over the cities and towns in which they live. Places are not only material but are also informational. Place is made up of memories, stories, information and histories. What is Johannesburg? It is a city of trees and buildings, concrete and sand. It is also constituted by a myriad statements made by multiple actors, some of which are represented by information in books, in census reports, in tourism leaflets and photographs (Graham et al., 2015). Today, much of that information is digital and available on the Internet. Spatial information is either digitized from analogue sources or in increasingly “born digital” (created as digital data rather than scanned or translated into digital formats) and can take a range of forms such as geotagged images on Instagram, hashtags on Twitter, annotations on Google Maps and Wikipedia articles, in addition to official data from government and corporate sources. 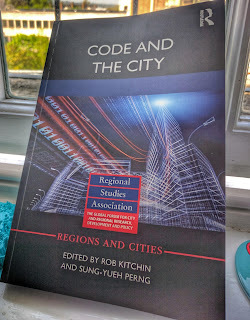 In addition to the enhanced ability of ordinary people to contribute to the digital representations of cities (Goodchild, 2007; Graham, 2013; Hacklay et. al., 2008), we have also seen a growing centralization in the control of platforms that mediate everyday life. Silicon Valley-based Google, Facebook, Twitter and Wikipedia have become the most-used websites and digital platforms in most countries, and some scholars (Introna and Nissenbaum, 2000; König, 2014; Morozov, 2013) warn of the dangers of increasing centralization and commercialization of the guiding forces of the Internet. The power yielded by search engines, in particular, has come under increased scrutiny by researchers in recent years. Introna and Nissenbaum (2000: 1), for example, have shown how search engines “systematically exclude… certain sites, and certain types of sites, in favor of others”. Eli Pariser (2012) argues that search engines drive the construction of “filter bubbles” that only show users information that they agree with. Our increasing reliance on search engines like Google constitutes what Siva Vaidhyanathan (2012) refers to as an “outsourcing” of judgement to Google, particularly because search engines have become critical to the public health of the Internet (König, 2014). As place becomes increasingly digital and the digital becomes increasingly spatialized, Graham and Zook (2013) have shown that informational filter bubbles can manifest into material divisions and barriers. The goal of this paper is to highlight a new problem. As digital data becomes increasingly abstracted into short data statements that can be shared and interconnected according to logics of “the semantic web” or “linked data, the concentration of power in the hands of search engines has been enhanced still further. We argue that the increased control of search engines over human knowledge has been garnered due to the loss of provenance, or source information, in data sharing algorithms. When the links between information and their sources are severed, users’ capabilities to actively interrogate facts about the world are significantly diminished. Paul Groth (2013) has noted that the loss of provenance information in semantic web projects is a significant challenge (c.f. Groth, 2013) but we explore the socio-spatial implications of this technological change by focusing on what the loss of provenance information means for how people experience and represent place. We highlight the origins and consequences of the loss of provenance information in the context of the contemporary moment in which the web is being significant re-engineered. What first appears to be merely a simple engineering problem turns out to be indicative of the growing commercialization of the web, a problem that stems from the dominance of an epistemology that sees knowledge about the world as essentially reducible to depoliticized data that is natural and obvious, rather than what it actually is: a re-constructed representation that obscures the origins of information and, in so doing, reduces the ability of ordinary users to interrogate that data. Despite the promise of the move towards a more semantic web (Egenhofer, 2002) for more precise digital representations of place, there has been a parallel decrease in the capabilities of people to interrogate and control that data. Graham, M. 2012. The Problem with Wikidata. The Atlantic Apr 6, 2012.